Local media confirms former mayor has thoughts. Westlock, Alberta is so barren these days. The town is still hibernating from winter’s last asphyxiating embrace. The tractor museum’s not even open until May. No one reports on those whimsical thoughts. No headlines dominate news websites across two provinces like when he first took the job as Westlock’s CAO. Flying back to Halifax for Easter weekend to serve fish and chips, Peter Kelly thinks about some more things. He daydreams about jobs he might, could, possibly have one day. Suddenly, those quaint ideas are in the news. Sources anonymously confirm Peter Kelly does indeed have thoughts. Radio stations talk about him. People are tweeting about him. They’re listening again! Halifax is ablaze with excitement. Could Peter Kelly be trying for the political failure trifecta? He remembers Michael Keaton’a voiceover from that Birdman movie he didn’t see (Westlock doesn’t get a lot of Iñarritu). More thoughts swirl through Peter Kelly’s head. 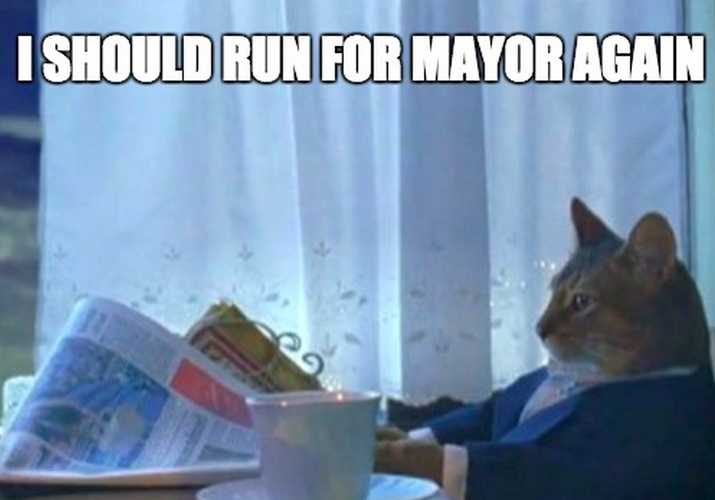 It might be tricky to pull off a mayoral campaign in Halifax. But then again, nobody in Westlock reports on his imagination.